V Bratislave sa v dňoch 11. a 12. mája 2018 budú konať "DNY STARÉJ PAZOVY 2018". Veľvyslanec prof. Dr. Momčilo Babić a Veľvyslanectvo Srbskej republiky v Slovenskej republike srdečne pozývajú všetkých aby svojou prítomnosťou podporili toto hodnotne podujatie. Interview so srbským veľvyslancom v Slovenskej republike. Pursuant to the Law on Privatization that was passed by Serbian Parliament on August 2nd 2014, and entered into force on August 13th 2014, the Privatization Agency has announced the public invitation for collecting letters of interest, inviting investors to express their interest in privatization of specific companies. Privatization Agency portfolio includes 502 parent companies and their subsidiaries from the following industries: administrative and support service activities (13), construction (51), public administration and defense; compulsory social security (1), human health services (16), IT and other information services (73), education (1), other services (4), agriculture, forestry and fishing (35), real estate activities (1), manufacturing (113), mining and quarrying (6), transportation and storage (21), electricity, gas, steam and air conditioning supply (7), water supply, sewerage, waste management and remediation (5), professional, scientific and technical activities (67), wholesale and retail trade; repair of motor vehicles and motorcycles (83), arts, entertainment and recreation (3), accommodation and food service activities (21), financial and insurance activities (15), for which the Public Invitation is announced. Letters of Interest shall be submitted by mail or directly to the Agency at 23 Terazije Street, or via e-mail to loi@priv.rs, not later than September 15h 2014. Pursuant to the Law, mandatory deadline for privatization of socially owned capital is December 31st 2015. V Bruseli sa dňa 16. júla 2014 uskutoční medzinárodná darcovská konferencia, ktorá bude mať za cieľ zbierku pomoci pre potreby odstraňovania dôsledkov katastrofálnych záplav, ktoré zasiahli Srbskú republiku a Bosnu a Hercegovinu. Konferenciu inicioval prezident Srbskej republiky Tomislav Nikolić v rozhovore s prezidentom Francúzska Francoisom Hollandom, pričom túto myšlienku podporil aj generálny tajomník OSN Pan Ki-mun. 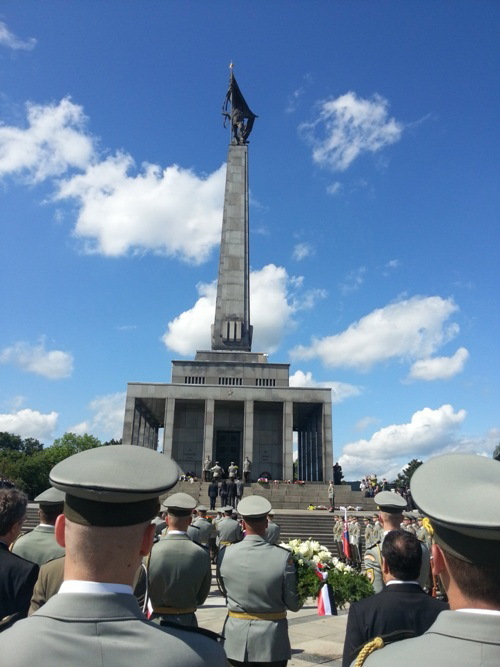 Koordinátori konferencie – Európska komisia, Francúzsko a Slovinsko rozoslali pozvánky veľkému počtu oficiálnych predstaviteľov štátov, medzinárodných organizácií, civilného sektora a súkromných spoločností, za účelom zabezpečenia univerzálneho charakteru konferencie a čo najväčšieho počtu účastníkov. Očakáva sa, že sa prezidenti Srbskej republiky a Bosny a Hercegoviny obrátia k účastníkom, zatiaľ čo pracovná časť bude prebiehať na ministerskej úrovni. Okrem politického odkazu a humanitárnej dimenzie sa darcovská konferencia bude zaoberať aj problematikou riadenia kríz, preventívnymi opatreniami v rámci politiky civilnej ochrany, klimatickými zmenami a odlesňovaním, pričom budú prezentované oficiálne dokumenty, týkajúce sa odhadovanej výšky škôd a rozsahu potrieb Srbska a Bosny a Hercegoviny, modalitami rekonštrukcie (verejné/súkremné financovanie), zatiaľ čo na záver budú potenciálni darcovia vyčleňovať čiastky určené na pomoc (finančnú alebo materiálnu), a to pre každú krajinu osobitne. Prípravné stretnutie Darcovnskej konferencie sa uskutoční dňa 8. júla 2014 v Paríži. Očakáva sa, že počas prípravného stretnutia sa bude diskutovať o predbežných správach, týkajúcich sa odhadu potrieb Srbskej republiky a Bosny a Hercegoviny, zatiaľ čo závery stretnutia poslúžia na vyslanie niekoľkých kľúčových posolstiev počas Konferencie. On the occasion of unprecedented natural disaster that has struck the Republic of Serbia, the Ministry of foreign affairs of the Republic of Serbia established the Crisis Staff, in order to coordinate activities related to collect aid donations from abroad. - Account in foreign currency, bank account No 01-504619-100193230-000000-0000 - Ministry of finance - Treasury, Belgrade, special account to flood-affected areas, IBAN RS 35908504619019323080. Payment instructions from outside Serbia are available here. The Crisis Staff can be contacted by phone +381-66-8066-020 or by email: kriznistab@mfa.rs. The Ministry of foreign affairs would like to thank you for possible donations. 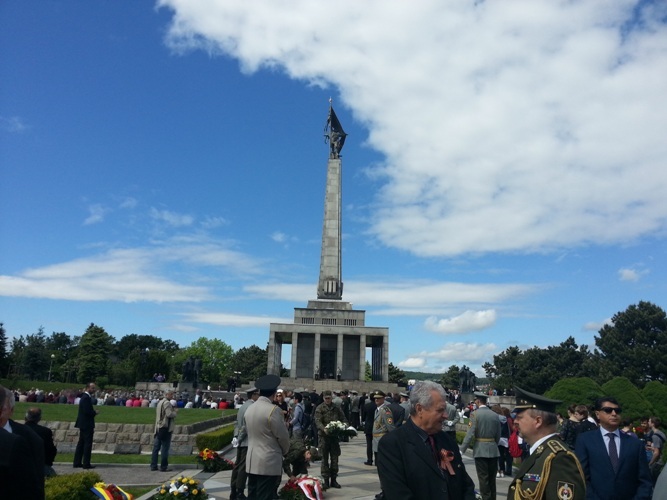 On May 9th, 2014, Ambassador Šani Dermaku laid a wreath at Slavin War Memorial in Bratislava, to mark the 69th anniversary of the Victory Day over fascism. 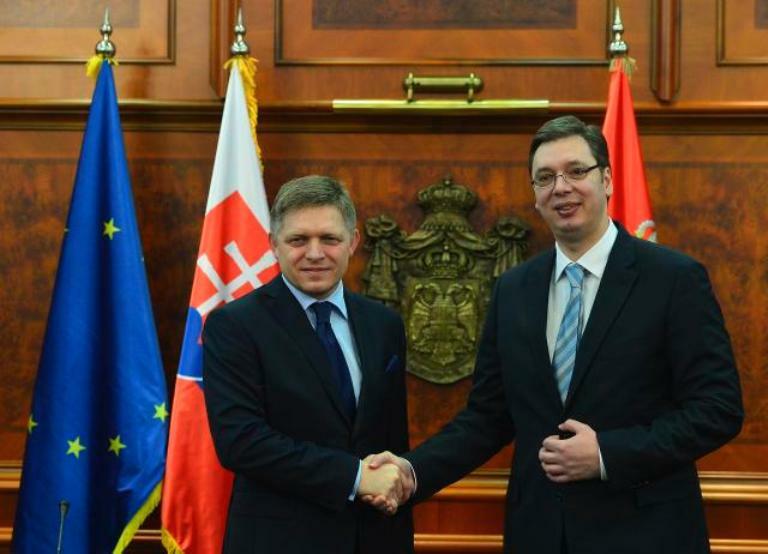 Prime Minister of the Slovak Republic Robert Fico, who led the delegation comprising Minister of Foreign and European Affairs of the Slovak Republic Miroslav Lajčak, made an official visit to Serbia on January 24th, 2014. 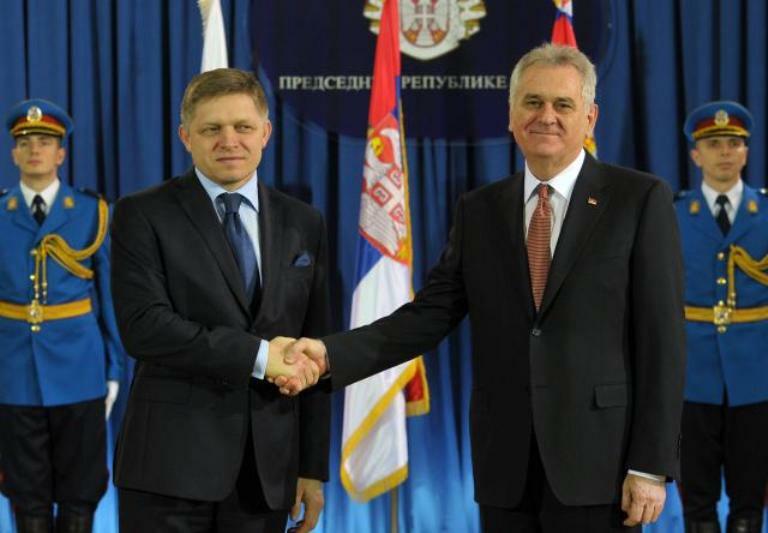 During the visit, Prime Minister of the Slovak Republic Robert Fico, met with the President of the Republic of Serbia Tomislav Nikolić, Speaker of the National Assembly of the Republic of Serbia Nebojša Stefanović, his host Prime Minister of the Republic of Serbia Ivica Dačić and First Deputy Prime Minister of the Republic of Serbia Aleksandar Vučić. The talks were also attended by Minister of Foreign Affairs of the Republic of Serbia Ivan Mrkić and Minister of Transport of the Republic of Serbia Aleksandar Antić. Prime Minister of the Slovak Republic Robert Fico is the first high official of an EU member state who visited Belgrade following the opening of accession negotiations of the Republic of Serbia with the EU on January 21st, 2014. During the talks with the highest Serbian officials, the two sides reiterated the existing good relations and the support of the Slovak Republic in the Republic of Serbia’s European integration process and its willingness to transfer experiences gained during its own negotiation process. 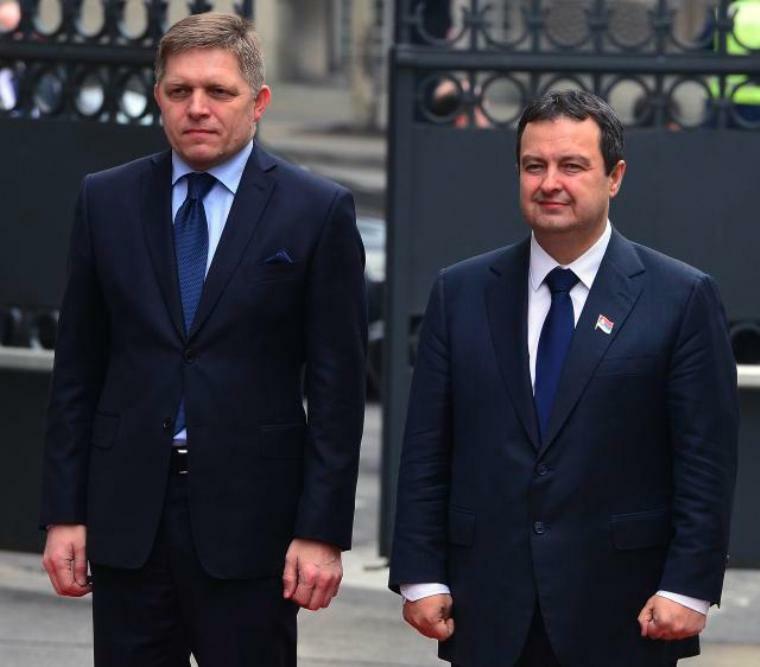 Prime Minister of the Slovak Republic Robert Fico symbolically handed over the keys to the European Union to Prime Minister of the Republic of Serbia Ivica Dačić as a show of support of the Slovak Republic to the Republic of Serbia. The Serbian side expressed gratitude to the Slovak Republic for its respect of the Republic of Serbia’s territorial integrity and refusal to recognize the unilaterally declared independence of Kosovo and Metohija. It was concluded that the overall relations are good, but that there is room for improvement in the economic cooperation. Foreign Minister Ivan Mrkic addressed a letter to the Foreign Ministers of EU Member States thanking them for their cooperation and support of the Republic of Serbia to open its EU accession negotiations on 21 January. In a letter to the Deputy Prime Minister and Minister of Foreign and European Affairs of the Slovak Republic Lajčak, Minister Mrkić expressed his gratitude for the support to Serbia on its EU path, stressing that Serbia is ready to start negotiations, and it will invest all its energy to fully incorporate EU values into its society and become a reliable partner of the EU. On November 25, 2013, H.E. Sani Dermaku, Ambassador of the Republic of Serbia, presented the Letter of Credentials to H.E. Ivan Gasparovic, President of the Slovak Republic, during the official ceremony at Grassalkovich Palace. During the meeting, it was jointly noted that two countries have traditionally good and friendly relations. President Gasparovic said that Serbia is a key country in the Western Balkans, and reiterated the readiness of Slovakia to give support to Serbia on its way to the EU. Ambassador Dermaku thanked the Slovak Republic for supporting Serbia in its European integration as well as its stance on non recognizing Kosovo's unilaterally declared independence. Ambassador Dermaku added that Serbia sees Slovakia as a close friend. 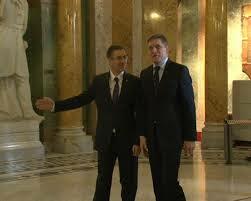 On December 13th, 2013, ambassador Šani Dermaku visited the National Council and talked with the President Pavol Paška. During the talks, it was expressed support to Serbia’s European integrations and reiterated Slovakia’s clearly position on non recognizing Kosovo’s unilateral declared independence. It was concluded that bilateral relations are good and that parliamentary cooperation should be further developed.